Greek beaches can be wonderful, or awful, depending on your perspective. If you’re looking for relaxation and end up staying by a party beach you’ll hate it, but if you get it right you’ll have a great time. So, first do some research. It’s also important to go to the right island, or location on the mainland, where you’ll get some choice, in case you don’t get it right the first time or are looking for some variety. With a bit of luck, you’ll find the right beach quickly – then all you need to do is lie back, enjoy the rays and/or activities on offer, either with adult or younger company. 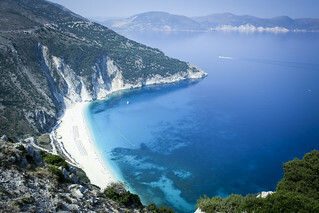 One thing’s for sure though, Greece has a lot of beaches from which to choose and below are just a few of them. 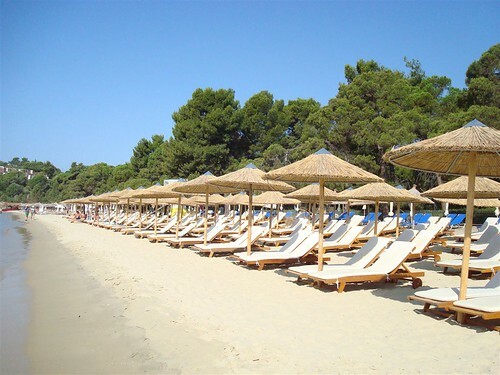 Koukounaries (pine cones) beach on the island of Skiathos offers the best combination for all. Shady pine trees right by the white sand – and there’s plenty of it – perfect for families. If it’s Greek islands you love, then it might be worth going to a large one for the best choice of beaches. Erimoupolis (abandoned town) beach by the ruins of Itanos in Eastern Crete lies between rocky hills and a historic cemetery and is best visited during weekdays. 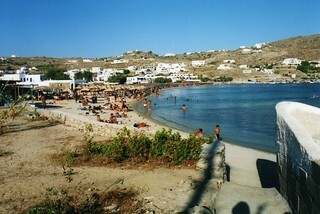 Ornos beach in Mykonos is popular with the trendier set, who seem to love this island. 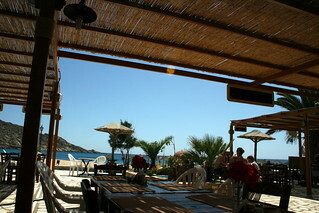 The beach also offers a choice of upmarket tavernas. The iconic pebbly beach of Aghios Ioannis in Corfu is framed by pretty hills and olive groves and is much loved by local and visiting romantics alike. Staying off the West coast of Greece for the moment, the pristine white pebble Myrtos beach in Kefalonia offers wonderfully crystal-clear swimming waters by a dramatic steep hill backdrop. 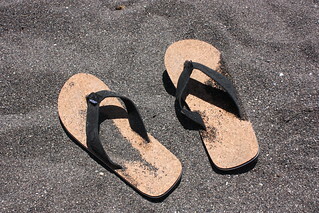 The volcanic black sand Perivolos (garden) beach in Santorini provides a dramatic contrast to the land and makes you feel as if you’re swimming in a primordial inky archipelago. On the tiny party island of Ios, Mylopotas beach is ideal for relaxing and enjoying a mid-morning swim. The few laid-back bars encourage socialising in a relaxed atmosphere. In the north of Greek mainland, the extensive Sani beach in Halkidiki offers a cosy, cosmopolitan atmosphere, safe swimming, many tavernas and a good choice of watersports for everyone.